Shouldn’t this be easy to find? I knew and believed deep down that Jesus’ love, this Divine Mercy, is unconquerable. Christianity is global. This mercy should be commonplace. But New York I know was a spiritual wasteland. Any critic of Catholicism can pick from a dozen examples from New York alone: news reports of parishes closing or combining, dwindling congregation, scandal, poor catechesis, etc. So I started looking. My friends said that if I search for something, I will surely find it. But what will I find? Grilling with God: Diocese of Brooklyn brings an evening of Adoration and a speaker for four straight weeks in June. 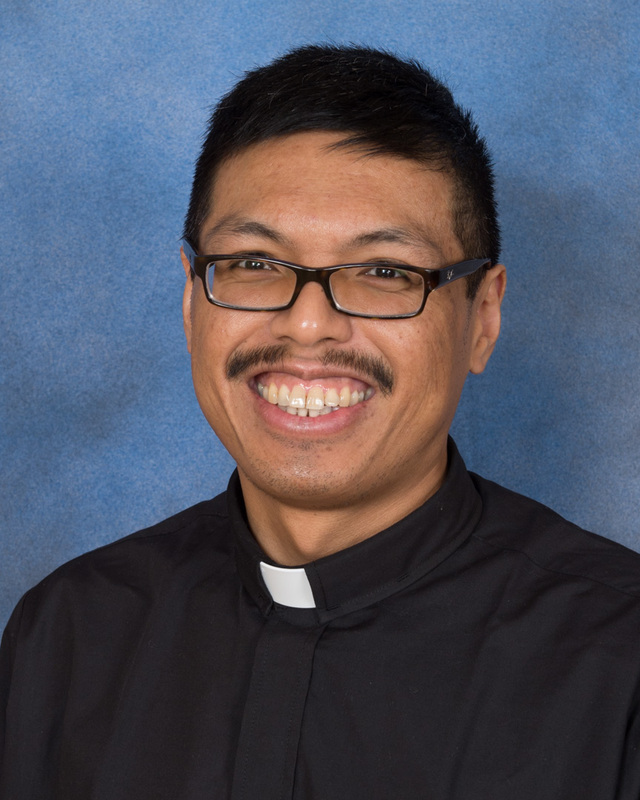 I was surprised to see my old elementary classmate, Father James Kuroly, in the first week. I met and chatted with other young adults and a few religious. Some have traveled far to Holy Child Jesus Church in Richmond Hills. 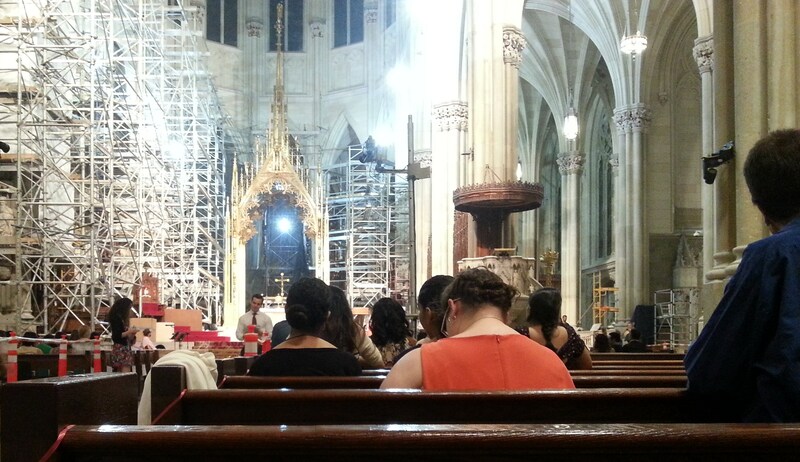 Holy Hour before the Young Adult Mass at St. Patrick’s Cathedral on Aug. 5. Young Adult Mass at St. Patrick’s: This Mass brings young adults from around the city. My first one, celebrated by Cardinal Dolan, made a big impression on me. Plus, there are several priests available for Confession. Win-win for me. The social event at Connolly’s, a nearby bar, can be very crowded. It’s better to start chatting with people after Mass in the cathedral and walk together to Connolly’s. P3 (Prayer, Penance and Pub): Holy Innocents Church near Penn Station had become a second church home for me. The church is beautiful. The priests celebrate at 6 p.m. a traditional Latin Mass. P3 starts with a talk by a priest during Adoration. Confession is available although I had been frustrated when I tried to use it. The social gathering afterward has the perfect mix of a large attendance of young adults yet small enough to have a conversation. I was surprised to meet two nieces of Father Tim Gallagher, OMV, a priest who was influential in me joining the Oblates. Sometimes, I would bump into beautiful churches during a trip to the city. I found three in the Upper East Side when I was heading to a Toastmasters meeting: St. Vincent Ferrier, St. Catherine of Siena and St. John the Martyr. I might have been searching high and low across the city. Yet my mother would point to things I least expected. Rosary at St. Anthony: Because of dwindling attendance, my childhood parish, St. Anthony of Padua, was combined with the parish of my baptism, St. Teresa of Avila, a few years ago. What could be found here? Yet my mother and her friends (all volunteers) arrive early, prep the church for daily Mass and recite the rosary. My mother would go out of her way to find and teach others to lead the rosary or a decade. Some of the leaders recite it in their native tongue. Where else can you find a rosary recited in English, Italian, French and Spanish? Spanish rosary: Knowing that I want to practice my Spanish, my mother brought me over to nearby Our Lady of Perpetual Help. A small cluster of women would recite the rosary in Spanish daily before Mass. I would go there Fridays and Saturdays for daily Mass. I was so intimidated by them that I sat apart. Eventually, the women allowed me to lead a few decades. I began to chat with a few of them. Funny thing: they were praying for vocations during the rosary. 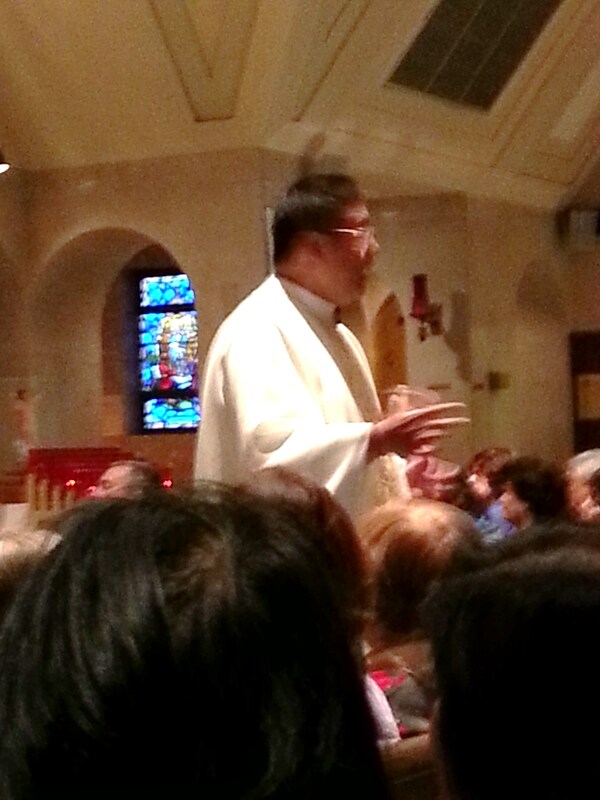 Healing Mass: My mother wanted to see a traveling priest, Father Joey Faller, at Our Lady of Fatima in East Elmhurst. His ministry in the Philippines focuses on praying for healing for those suffering from various ailments, emotional or physical. Somehow, I got recruited to be a “catcher,” someone to catch people when Father Faller prayed over them. One woman I caught was crying. It took a long time for her to rise. She lingered a bit shaken. I never saw anyone so moved just by being prayed over. After all this, what did I really find? 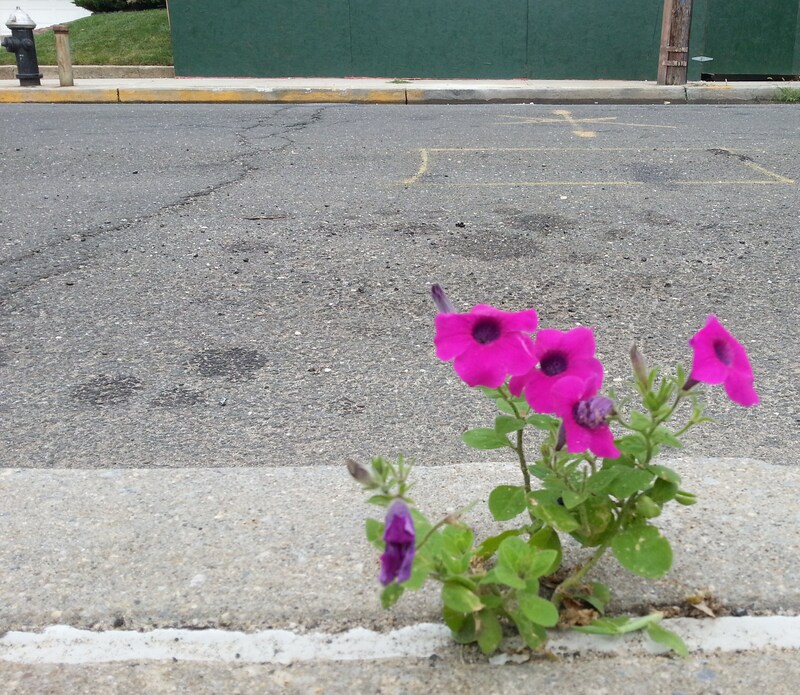 I pondered this when I remembered this flower growing in my block at the curb. When the world is mostly concrete, it’s pleasant to see how color and vitality breaks through. That’s the love of Jesus. Maybe that’s Divine Mercy. It doesn’t come in an overwhelming wave. Rather, it sprouts when least expected, small and vulnerable. 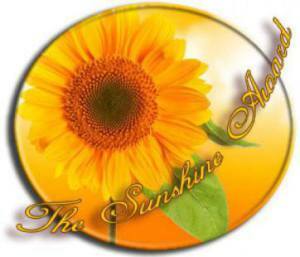 But it breaks the spiritual hardness to prepare for a blooming vitality.